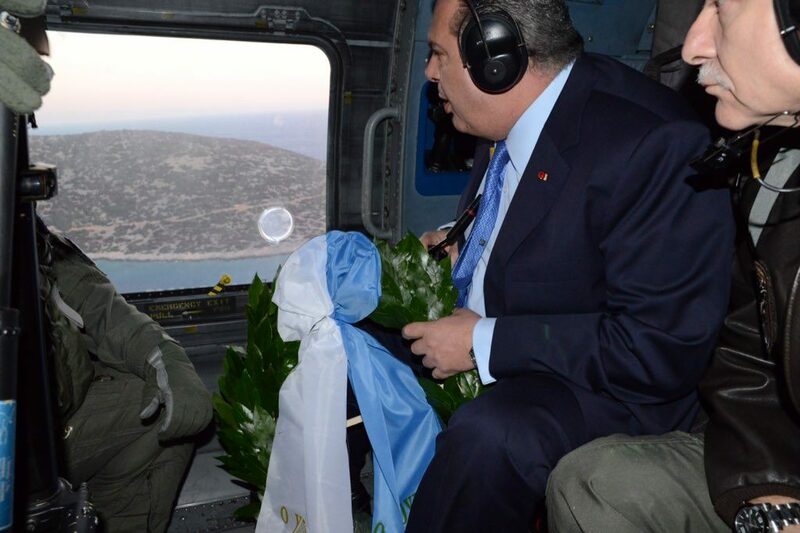 Turkish provocations in the Aegean continued on Wednesday as jet fighters of the neighboring country flew over Imia islet, just 30 minutes after Greek Defense Minister Panos Kammenos dropped a commemoration wreath by helicopter. According to a SKAI television report, half an hour after the Greek helicopter left the area, a pair of Turkish F16 flew over Imia and Kalolimno four times, beginning at 7:43 am at a height of 8.3 km. The Greek Air Force responded immediately as jet fighters identified and then intercepted the Turkish aircraft. Earlier the Greek minister flew by helicopter over Imia and dropped a wreath in memory of the three officers (Christodoulos Karathanasis, Panagiotis Vlahakos, and Ektoras Gialopsos) who died after their helicopter crashed at Imia on January 31, 1996. The Greek officers took off from frigate Navarino on a reconnaissance mission after Turkish commandos had embarked on the islet. Their helicopter crashed under mysterious circumstances, as was reported at the time, but there was wide speculation that the aircraft was hit by Turkish fire. The causes of death were concealed to prevent further escalation. Wednesday’s provocations follow the incident of Turkish Navy boats that sailed around Imia on Sunday, before they were chased away by the Greek Navy.